Something to look forward to: Apple showcased its newest watch at today’s Gather Round event. Due to a false start by the Apple Store this morning, many of the announcements were already known — larger display, new faces, and release date (among other things) were leaked pre-event taking the Apple Store offline. The most noticeable change coming to the Series 4 is the redesign of the chassis. The watch is 30-percent larger on its face (40mm and 44mm) and thinner front-to-back. Despite the physical overhaul, Apple still managed to wedge in a battery that will remain consistent with the Series 3’s 18 hours of usage on a charge. A slightly more subtle change in the design is a repositioning of the microphone so that it is on the opposite side as the speaker. Taking calls on the watch should be more clear with less echo. The speaker is also 50-percent louder, which is a very welcomed change in my book. Series 3 watches are far to quiet to hear well if for example, you take a call while jogging. The crown is now digital with haptic feedback as we reported a few months back. As you rotate the crown, a small haptic motor will simulate clicks. Part of the reason for making the crown digital is to allow for a sensor to take ECGs, which I will touch on later. Some changes under the hood include a new next-generation S4 chip that sports a dual-core 64-bit processor. This makes it twice as fast as the Series 3. Cellular reception has also been optimized for clearer signals, and fewer dropped or missed calls. 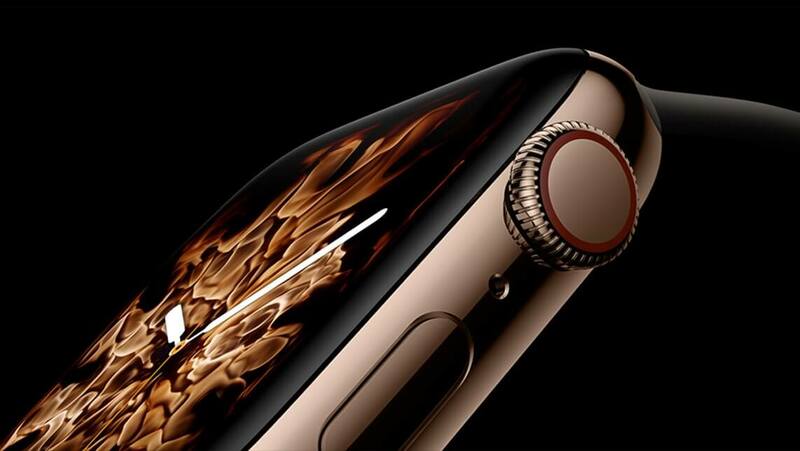 Apple Watch Series 4 also has a new accelerometer and gyroscope that can detect falls. When paired with watchOS the fall detector will ask if you are alright. If it does not get a response within 60 seconds, it will automatically call 911 and send them a message with your location. Falls are not the only thing the Series 4 can detect. We have been hearing about AFib detection lately and knew it was eventually coming to Apple Watch, and now it is here. With watchOS 5, the pulse sensor will occasionally capture your heart rhythm and notify you of an irregular beat. There will also be an ECG app coming later this year that will allow users to record and ECG by placing their finger on the digital crown. It works just like the Karia Mobile device and is sanctioned by the American Heart Association and approved by the FDA. There are a few new watch faces designs, but they all seem too noisy for my tastes. However, they are customizable allowing users to precisely display what information they would like to have on the screen. Pricing has gone up a little from the Series 3. The base model with GPS will retail for $399. The Series 4 with GPS and cellular will cost $499. Along with the release of the new watches, Apple is dropping the price of the Series 3 to $279. There will be several flavors to choose from in the way of color and material. Standard watch finishes are aluminum anodized in silver, gold, and space gray. There are also stainless steel finishes in black and steel. A gold stainless with a matching Milanese band will also be on offer. There is no word on the price differences in the stainless designs, but you can bet that they will be significantly more pricey.